We have a very lovely Cherry Blossom On our street verge and it is always the last to flower in the Street. Today I noticed the first of the buds had opened and you can almost gurantee that we will now get the wind. As every year it looks so nice for a day and then it is gone. Last year was the exception and we got almost a week of enjoyment! We have a horse chestnut tree in the middle of our driveway that is utterly beautiful when it first comes back into leaf too. You can pretty much guarantee that gale force winds will rip through shortly afterwards to shred the foliage though. Them’s the breaks, aye? Hey Linda is that the garden that you showed us a photo of back in August? If it is its certainly grown well! My Espaliered peach has just had its first flowering and now all the petals are gone, am just hoping the tiny buds that I think will become peaches will hang in there! Oh yeh and buggar all those greenies giving you hell on the cloth nappy thing, I bet they spout about being all ‘organic’ but don’t have their own vege garden or compost heap! Every spring I walk past the most beautiful display of cherry blossom trees next to the school my boy’s attend. This year the blossom on the trees seemed fuller than the last. With my new company in full swing it was the most perfect opportunity to put a styled theme together using the true glory of the trees. A race against the spectacular short lived Mother Nature event I managed to style a dessert picnic theme under the blossom trees and called the theme Blossom Magic. 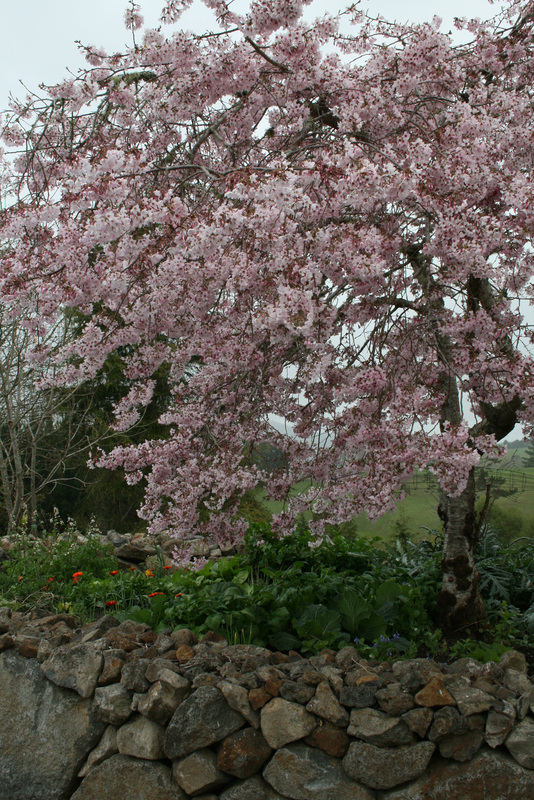 I have a flowering cherry tree which was a seedling growing in a gully trap in the front of the house. I moved it from there in 1974—- and it is now a huge tree of beauty. It has been a mass of single white blossoms for just over a week now, and as they drop the lawn is transforrmed into a sea of white. I just love this time of the year, but also know the Equinoctial Winds come from the west, and destroy the beauty. ( good for the washing though!! )Hopefully we will have another week to admire these beautiful blossoms. Our neighbour grizzles about it and wants the branches overlapping the fence, cut off!! Your vege garden is a picture. Looks so lush and green. I agree with Sharon re the ‘Greenies’. —– Hope Lucas is well.